I have been working on new features and modifications for my Photoconsistency Visual Odometry project. In the last version I have implemented two more C++ classes to estimate the 3D rigid transformation between two RGBD frames. In these new classes, the residuals and jacobians are computed analytically, significantly improving performance. 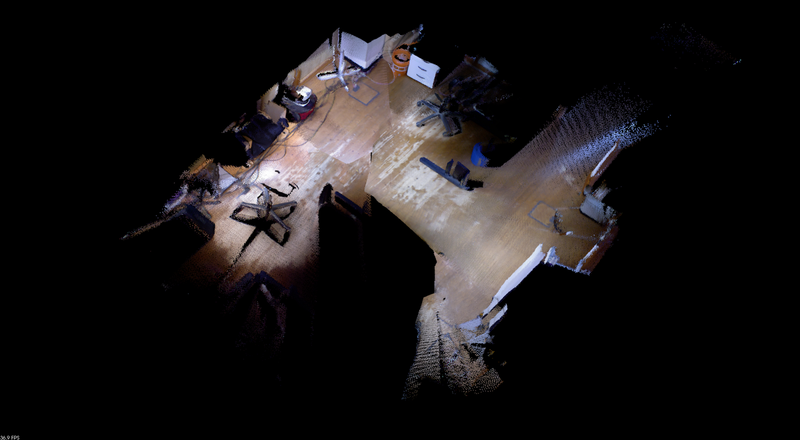 Top: resulting 3D map using the new Photoconsistency Visual Odometry implementation. 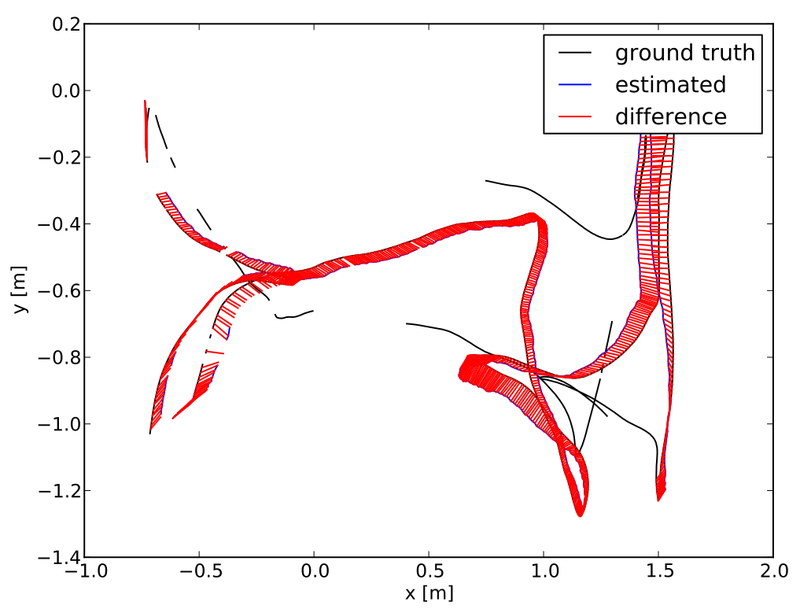 Bottom: visualization of the estimated trajectory over the ground-truth using the CVPR tools. The changes do not end up there; now the source code is organized in two different parts: the phovo library, which contains the Photoconsistency Visual Odometry algorithms; and applications that use this library. This way you can select to just build the phovo library (which only depends on OpenCV, Eigen and OpenMP), or configure the project to compile the provided applications too. Furthermore, I have implemented two new classes to access the Kinect sensor data for online operation. If you want to give it a try, please download the latest code from http://code.google.com/p/photoconsistency-visual-odometry/ and build your own 3D maps with your Kinect sensor. Thanks for your kind. I was confused about computeResidualsAndJacobians() in CPhotoconsistencyOdometryAnalytic. 1.How did you calculate the "temp1" ~ "temp26" ? and what are they meaning? 2.What is "jacobianPrRt" doing ? Is it related to the gradient of the image? I will answer your second question first :). Basically jacobianPrRt is the jacobian of the composition of two functions: projectiveFunction(rigidTransformationFuction). - projectiveFunction: This function projects a 3D point to the 2D plane using camera parameters. - rigidTransformationFunction: This function applies a 6DoF rigid body motion to a 3D point. - jacobianPr: This is the first order derivative of the projectiveFunction with respect to (x',y',z'). Where (x',y',z') are the 3D coordinates of a transformed (x,y,z) point. - jacobianRt: This is the first order derivative of the rigidTransformationFunction with respect to (x,y,z,yaw,pitch,roll). Ok, now I will answer to your first question. As you can imagine, the analytic form of the jacobian contains a lot of operations which are the same for all the 3D points. To avoid computing all those operations for every 3D point I have defined several temporal variables that help me obtain better runtime performance. Then I calculate the jacobian of both and multiply them to get jacobianPrRt (2x6). Is that anything wrong or I get the wrong way? As you say, jacobianPrRt's size is 2x6 and should be the same if you compute both jacobians and multiply them. Please take a look inside the CPhotoconsistencyOdometryBiObjective class. Within the CPhotoconsistencyOdometryBiObjective.h file, I calculated the jacobianProy and jacobianRt separately. Do you get different equations there too? Can you write me with your equations? After calculating jacobianProy and jacobianRt separately, I get the same equations as yours in CPhotoconsistencyOdometryBiObjective class. And I found that I forgot to transform the 3D points by rigid motion for projectiveFunction that is why I got the different equations. And I think the "temp11" should be cos(pitch)*cos(yaw), not cos(pitch)*cos(yaw)+x, in CPhotoconsistencyOdometryAnalytic class. When you calculate the transformed point, it will become px*(cos(pitch)*cos(yaw)+x). It should be px*(cos(pitch)*cos(yaw))+x. But I am not sure it is right. You did great job. This project really works for me. I'm running your program with ASUS X-tion pro, but the result is not good. Then I go into the source code and found that cameraMatrix could be the problem (Because you are running with Kinect). So, I calibrate X-tion pro and get intrinsics matrix, then replace cameraMatrix. First of all I apologize for my very late reply, I moved to another city and I had no time to answer before. It is very good to see that you found this project useful and that it worked for the X-tion pro camera with that minimal change. Hi Miguel. your project is very interesting, very nice work! I'm trying to extend it, by adding the loop closure detection, as you have done in another project (kinestslam6d). I'm using the very same graph optimization library(g2o), but i cannot figure out how to set the information matrix between 2 related poses in the graph(basically the edge). As a reference, I have the paper "Large-Scale Multi-Resolution Surface Reconstruction from RGB-D Sequences", which is the evolution of one of your references, but I've found that for some reason their proposal is not indeed working (the edges in the graph seem not to be weighted correctly by using the (J^t J)^-1). Do you have any suggestion? Did you face the same problem? Are you planning to add the graph optimization also to this fantastic project? I'm glad to know that you find this project useful. If you want to extend this project to add loop closure, we can collaborate together to make it possible. This is one of the things that I had in mind for a long time, so it would be nice to chat with you about possible solutions. I have some ideas on how to set the information matrix between two poses since I did this same thing for the kinectslam6d project as you mention. For that project I used one "heuristic" value to encode the edge weights based on the number of matched points, but for me it seems better to use the photometric residues for that. Please, send me an email so that we can schedule a chat to talk about this. I am also implenting visual Odometry, and i am using SURF features to compute the 3D rigid body transformation of the camera. I have implented it :) . But it produces bad results when it misses the features. My question is, is there any way to preprocess the image before i do the SURF on it so that i get same SURF features every time. And what to do when we have no features. How essential is TRACKING in this context. There is a lot to answer, but i would be glad if you answer. Hi Junaid, sorry for my late reply. If you want to track a set of feature points across multiple images you can try to use a similar approach to the one of Kanade-Lucas algorithm. Basically what you can do is to extract the feature points on one image and then track those same points over the next images until you loose the track for each point. 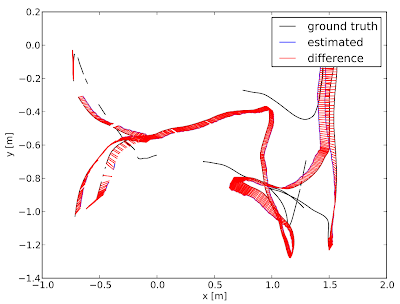 This approach will be faster than matching points on each pair of consecutive images and will also produce larger baselines for computing the relative rigid body motion, so you will probably improve the results. Sorry i forgot i am also using KINECT sensor to get the 3D information.